Any regular readers of this blog know that sun protection is really important to me and one of the issues that I push pretty strongly - both here on the blog and in my real life with my friends and family. There is no question (regardless of the internet trying to create some) that the sun can be dangerous and that we need to protect ourselves from it, not just for beauty purposes but for health. A year ago today I did a super post that is filled with information about the different types of sunscreen, why it's important and the myths about it. If you're interested in reading that, you can check it out here. 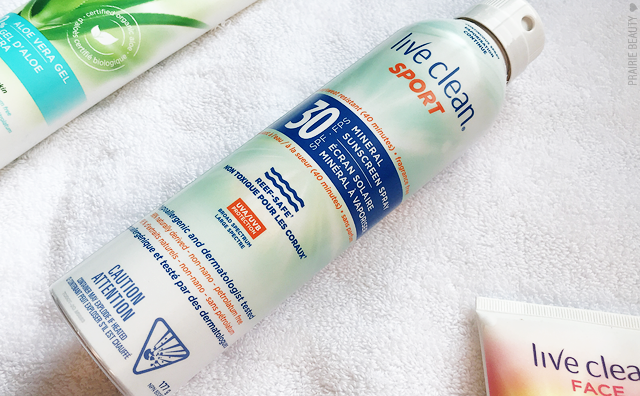 For the first day of summer this year, I wanted to focus on sun protection again with Live Clean, one of my forever go to brands, and I've got a sweet little GIVEAWAY for you guys as well! 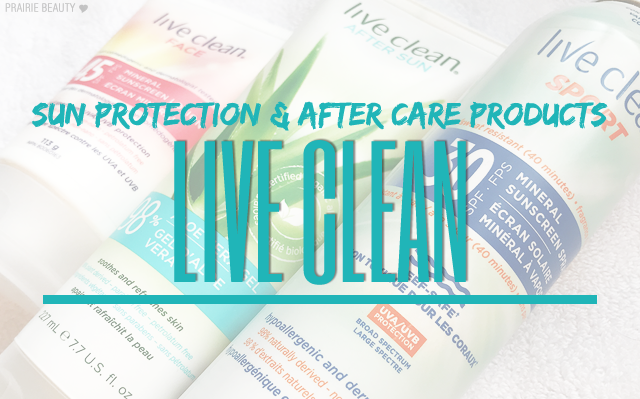 Every summer, whether I'm heading out to the beach or pool or just hanging out in my back yard, I'm making sure that I'm protected and Live Clean has consistently been a brand that I personally reach for when it comes to protecing my skin. All of their formulas are mineral (rather than chemical - check out my super post linked above if you're curious about what that means), 98% naturally derived, non-whitening, non-greasy, and easy to apply. 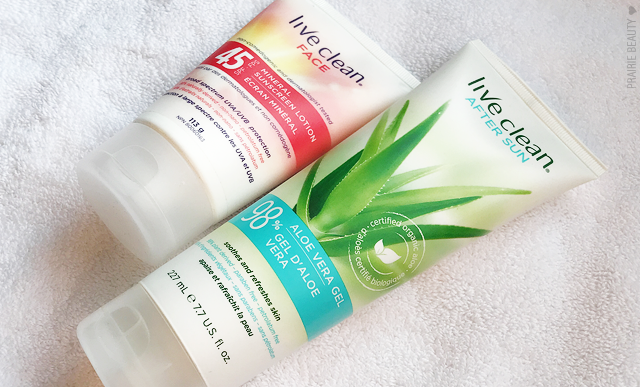 They also have their After Sun 98% Aloe Vera, which is absolutely lovely - and sometimes necessary even for someone like me whose obsession with SPF is the stuff of legend. New to the line up this year are two sunscreen sprays and I really couldn't be more excited. Though I don't mind rubbing a lotion SPF into my skin, I know that there are a lot of people who find that tedious and are much more likely to use sunscreen if it's available in an easy to apply spray. A lot of the sprays I've seen have been chemical sunscreens, so I love that we're seeing more brands going the mineral route with spray formulas since that is definitely my personal preference. And this one is SOLIDLY good, you guys. It has a slightly lower SPF, which means that you will have to apply a little bit more frequently, but it's so easy to apply that I don't personally have any problem with that. Also available in their Kids formula, I think this is phenomenal and seriously affordable option! 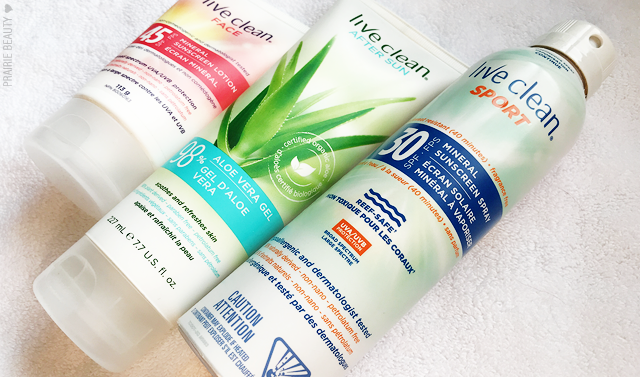 I feel like Live Clean really gets it done when it comes to their sun protection products. They have 45SPF lotions for Sport, Baby, and Face, have recently added their Baby and Sport sprays, and also have their After Sun 98% Aloe Gel, so I feel like you're covered with this line. They're also widely available and really affordable, which I think is definitely a huge plus for families specifically. Basically, they've got everything you need for a day out in the sun. The lovely folks over at Live Clean have been kind enough to offer another Giveaway for my readers - always exciting, right? 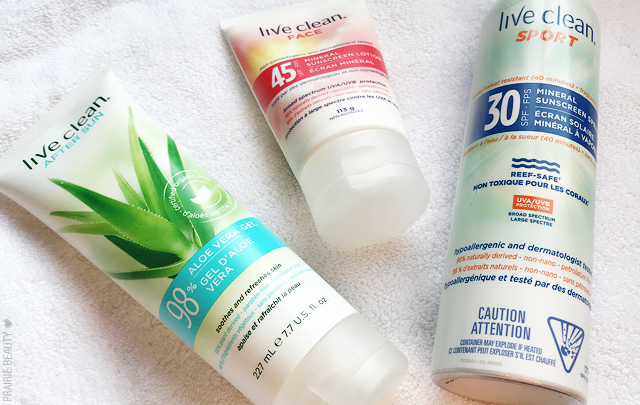 Enter below to win 1 of 3 prize packs featuring the Live Clean FACE 45SPF Mineral Sunscreen Lotion and the Live Clean After Sun 98% Aloe Vera Gel! Giveaway is open to Canadian residents. Must be of legal age to enter. Giveaway ends June 29, 2018 and 12:00AM.